We all overhear the watercooler conversations about which Netflix shows everyone’s into at a given point in time. But just how dedicated is the British public to binge-streaming shows, and how careful are we at savouring episodes of series we just don’t want to end? To answer these most pressing questions, Netflix has been busily analysing over 100 serialised TV series across more than 190 countries between October 2015 and May 2016, examining member completion of the first season for all series. The service has now released the details of our viewing speeds via an infographic titled ‘The Binge Scale’. The research shows that seasons on the ‘savour’ side are provocative and thought-provoking (dense, dialogue driven) and include dramas and irreverent comedies like House of Cards, Narcos and Unbreakable Kimmy Schmidt. Seasons that are devoured play heavier on emotions (fear, suspense, quick laughs) and include horror, thrillers and action like The Killing, Breaking Bad and The Walking Dead. Members in the UK savour Grace & Frankie, The Killing and Breaking Bad (they are devoured globally). UK’s most savoured show is Narcos (global is BoJack Horseman), most devoured show is The 4400 (global is The Fall). The 4400 is the most devoured show in the UK. This means that people watched it the quickest (on average members completed the series in 4 days / watch 2 hours, 30 minutes per day). This doesn’t mean that this show is the most popular show in the UK – it just means it was binged the quickest. The 4400 is about the reappearance of four thousand four hundred people who vanished over the course of five decades. None have aged, and slowly it’s revealed that they have mysterious powers. So, this fits with the global findings that people devour horrors and thrillers the quickest! Narcos was the most savoured show in the UK. The data examines viewers who binged the show within a week. Narcos was the most savoured show (on average members complete in 6 days / watch 1 hour, 45 minutes per day) but it was definitely still binged. The genre of Irreverent Comedies remains at the furthest side of the savoured scale. Narcos is a stand alone anomaly as the most savoured show but Comedies also featured high up in the data and therefore keep their places as number one savoured genre. 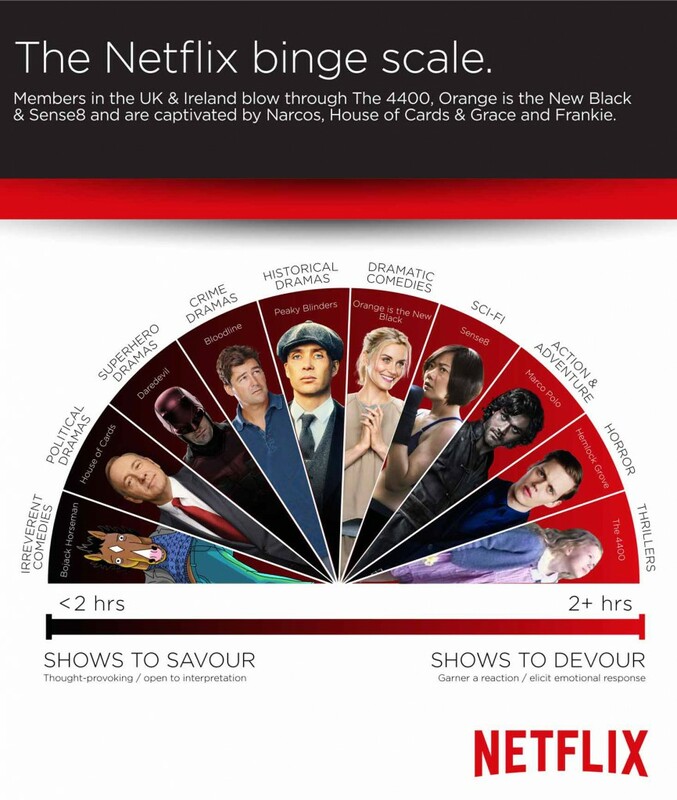 The full Binge Scale is detailed below. Where abouts do your viewing habits fit on the spectrum?